Today saw the switching on of the 200th superfast broadband cabinet to be installed as part of the CSW Broadband programme, lead partners Warwickshire County Council and BT announced. This major milestone was celebrated by residents and businesses in Lawford Heath, Rugby who can now access faster fibre broadband following the installation of their very own road-side fibre cabinet. It’s around 16 months since the CSW Broadband partnership started connecting the first premises to faster fibre broadband. 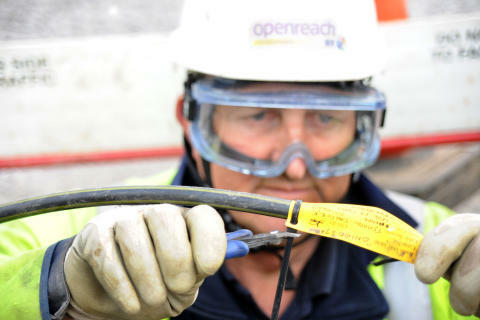 With the installation of 200 road-side cabinets, engineers from Openreach – BT’s local network business - have already made the high-speed fibre optic technology available to nearly 40,000 homes and businesses. Mark Pawsey MP, Parliamentary Private Secretary to the Small Business Minister, said: "Having developed and run a business in Rugby I am acutely aware of the need for excellent communications for businesses. This 200th CSW Broadband cabinet coincides with the Government’s national Broadband Delivery UK programme passing three million premises with the new fibre network. This underlines the Government's commitment to ensuring that UK businesses can compete in an increasingly global economy." Neil Woolman, local resident and broadband champion, said: "As a serving fireman it is sometimes difficult for me to do my computer-based work on a busy fire station, due to getting called out. Whilst I can in theory connect to the work databases from home this has not been possible until now because of the slow broadband speeds that we have experienced for many years. I have also started a new business venture from home which means I have to use the internet every day which can be quite frustrating as simple tasks like downloading and surfing the internet can take a long time to complete. “My three teenagers are all delighted too. Downloads that previously took hours to complete can now be done in minutes, and they can save money through no longer having to rely on their mobile connections to Skype friends or for online gaming". Bill Murphy, BT’s managing director for next generation access, said: “Today marks another very important stage in the rollout of an exciting technology, which is transforming the lives of communities across Coventry. Solihull, Warwickshire and the UK as a whole. 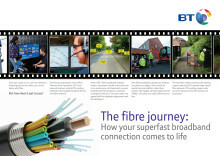 “BT’s multi billion pound investment in superfast broadband through its involvement in partnerships and its own commercial programme has already made fibre broadband available to many hundreds of thousands of households and businesses across the West Midlands – and the number is continuing to grow rapidly. Our Openreach engineers are rolling out the technology at a world class pace, reaching thousands more premises every week. It’s an ‘opt in’ service, but because the network is being installed by Openreach it is ‘open’, so residents and businesses wanting to upgrade have a choice of broadband service providers, with more than 140 now operating in the UK. Local people choosing to upgrade will be able to get download speeds of up to 80 megabits (Mbps) and uploads of up to 20Mbps*. Openreach engineers will complete the upgrade work during 2016, marking the end of the first part of the ambitious CSW Broadband roll-out**. In February, CSW Broadband announced a further £10.73 million funding that will extend the reach of fibre broadband to another 17,000 homes and businesses across Warwickshire and Solihull***. This is in addition to the current roll-out programme. CSW Broadband is a partnership of eight Local Authorities (Coventry, Solihull, Warwickshire and the Boroughs and Districts of North Warwickshire, Nuneaton and Bedworth, Rugby, Warwick and Stratford on Avon) with BT and the Government’s BDUK programme. Anyone interested in the roll-out of faster fibre broadband can register their details through the CSW Broadband website – www.cswbroadband.org.uk to receive updates when work is happening in their area. Updates on the roll-out are also available on Twitter and Facebook. The announcement comes on the same day as Government has announced the nationwide roll-out of superfast broadband has now passed more than three million UK homes and businesses. The roll-out is on track to reach 95 per cent of the UK by 2017 and is now reaching around 5,000 additional premises every day. **The first phase of the CSW Broadband project will ensure around 40,000 premises in the project area have access to superfast broadband. When combined with private sector investments, 91 cent of the area’s homes and businesses will have access to superfast broadband by Spring 2016. ***A second phase was spearheaded by Warwickshire County Council and Solihull Metropolitan Borough Council. When complete, it will increase the percentage of homes and businesses able to access high-speed fibre broadband in Coventry, Solihull and Warwickshire to nearly 94 per cent when combined with the first phase of the CSW Broadband roll-out already underway and the private sector investments of companies like BT. Planning and surveying on the second phase will begin next year, and engineers will start connecting the first premises towards the end of 2016. The upgrade work will continue during 2017, 2018 and into 2019. CSW Broadband is a partnership of eight Local Authorities (Coventry, Solihull, Warwickshire and the Boroughs and Districts of North Warwickshire, Nuneaton and Bedworth, Rugby, Warwick and Stratford on Avon) with BT and the Government’s Broadband Delivery UK (BDUK) programme. Under the first phase of the CSW Broadband project (known as Contract 1) engineers began connecting homes and businesses in April 2014. In this phase the CSW Broadband partnership is contributing £4.5 million, with £6.57m from BT and £4.5m from BDUK. This phase of the CSW Broadband partnership will ensure around 40,000 premises in the project area have access to superfast broadband. When combined with private sector investments, 91 cent of the area’s homes and businesses will have access to superfast broadband by Spring 2016. A second phase (known as Contract 2) was spearheaded by Warwickshire County Council and Solihull Metropolitan Borough Council, which are contributing an initial £3.68 million and £0.38 million respectively, with an additional £2.61m from BT and a further £4.06m from the Department for Culture, Media and Sport’s Superfast Extension Programme (SEP). When complete, it will increase the percentage of homes and businesses able to access high-speed fibre broadband in Coventry, Solihull and Warwickshire to nearly 94 per cent when combined with the first phase of the CSW Broadband roll-out already underway and the private sector investments of companies like BT. The CSW Superfast Broadband Programme is in addition to, and separate from, Coventry City Council’s ‘Super Connected Cities’ Programme.